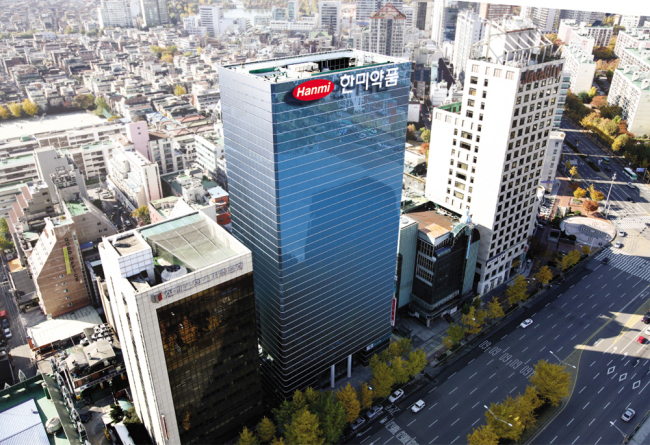 South Korean prosecutors raided the Hanmi Pharmaceutical headquarters in southern Seoul on Monday as part of a probe into suspicions the local drugmaker leaked information on a major deal termination to select investors in insider trading. The Seoul Southern District Prosecutor’s Office said it has seized documents, hard disks and other potential evidence containing information on Hanmi’s disclosures and licensing deals. Hanmi is alleged to have given an early notice to select investors that Boehringer Ingelheim ended its licensing partnership over Hanmi’s lung cancer drug on Sept. 29, before making an official disclosure on Sept. 30. The firm is also suspected of intentionally delaying its official announcement of the major deal breakup to buy select investors more time to withdraw or short-sell Hanmi shares. The search-and-seizures came one day after the Financial Services Commission handed over the Hanmi case to the prosecution through fast-track procedures that expedite investigative procedures for finance-related crimes. In question is the timing of Hanmi’s disclosures on key deals that led to major stock price fluctuations and consequent damages to investors last month. At 9:29 a.m. on Sept. 30, Hanmi disclosed that Boehringer Ingelheim terminated its licensing partnership over Hanmi’s new lung cancer drug Olmutinib. The announcement led the price of Hanmi shares to plummet by 18.06 percent to close at 508,000 won ($446) that day. The negative disclosure had come 29 minutes after the firm’s stock price spiked nearly 5 percent in early morning trading on a disclosure made after trading hours on Sept. 29 that Hanmi clinched a new licensing deal with Roche-owned Genentech valued at $910 million. This particular sequence of events ignited suspicions that Hanmi intentionally timed its announcements to favor select shareholders. Other investors would have been encouraged to buy Hanmi shares at a higher price after the Genentech deal, without knowing that the price would plunge again on news of the broken Boehringer Ingelheim deal. Moreover, a record high amount of offloading and short-selling took place on Sept. 30 — investors short-sold as many as 104,327 Hanmi Pharmaceutical shares — fueling further speculation that some stakeholders, particularly institutional investors, may have been aware of the unfavorable announcement before others. The Korean drugmaker said it was notified of Boehringer Ingleheim’s decision at 7:30 p.m. on Sept. 29. However, it did not immediately post the information on the electronic disclosure system for processing by KRX officials on duty, as dictated by standard procedure. “We thought the news might cause confusion in the market since we had announced the favorable Genentech deal at 4:30 p.m. that day,” said Hanmi Vice President Kim Jae-sik. “Considering the gravity of the deal breakup issue, we thought we could not leave the matter to a KRX official on night duty,” Kim said. Hanmi officials visited the KRX office at around 8:30 a.m. on Sept. 30 to make the announcement. “After a thorough review of the related contract and due approval procedures, the disclosure was made at 9:29 a.m. We apologize for the delay, but there were no other reasons,” Kim added. The KRX has discredited Hanmi’s assertions, saying that the company can make immediate disclosures without approval from the KRX.